Wolfling by Gordon R Dickson is the first book I completed for this year’s Vintage SciFi Month! It’s a really enjoyable page turner of a book, which places humanity and Earth high up on a pedestal. Mild spoilers to follow the photo below. The cover itself is excellent! 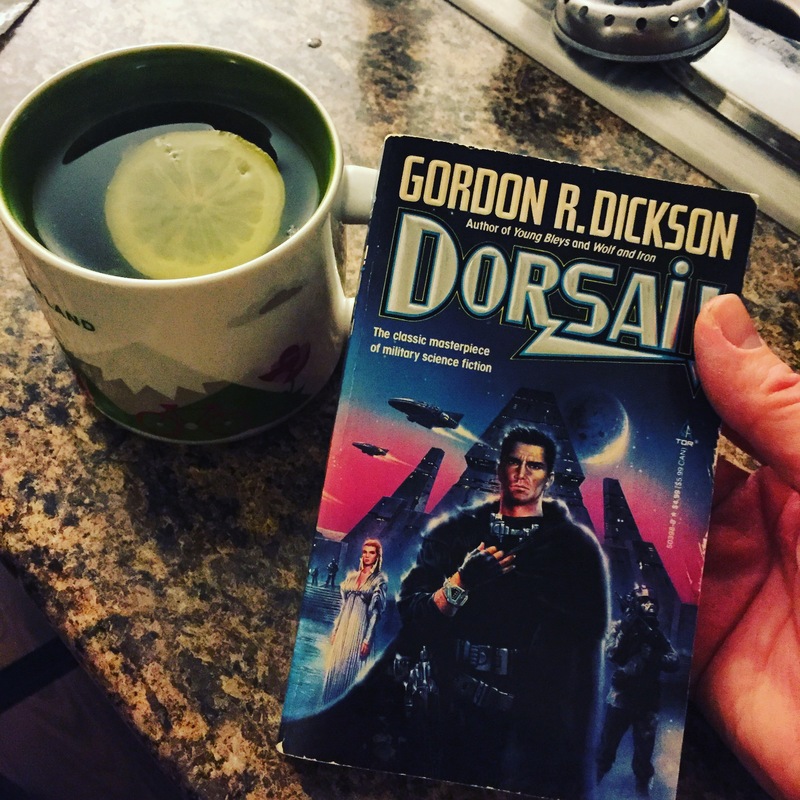 And I have enjoyed reading Gordon R Dickson’s books each January for this special month and this book was a good continuation of that enjoyment! That said it’s really arrogant and human-centric. I doubt seriously if we came in contact with a superior alien race that we’d be able to go toe to toe with them much less outplay them at their own games. Also… some of the terminology and situations were troubling from both a modern perspective and from the age in which GRD wrote this tale too. The plot and primary character is interesting though so overall I enjoyed this tale. The question what put forth of how these Vintage SciFi books age. Do they stay applicable or get passed by. It’s a tricky question that probably applies to each book differently. I think for the most part GRD’s books don’t stay applicable as they rely so heavily on the author’s outdated philosophies, but the stories remain interesting and there are thought provoking points which are worth mining out of the stories. I don’t want to sound unfair to GRD, I really do think he’s a great author, I just think the more I read of his the more I see his biases shining through. This entry was posted in Book Reviews, VintageSciFiMonth and tagged bookreviews, GordonRDickson, RedStarReviews, scifi, VintageSciFi, VintageSciFiMonth, WhatImReading on January 20, 2019 by redstarreviews. DORSAI! will always be a favorite book for me. Yet even with this third read through I still feel this book is hurried. I wish the author had taken more time exploring Donal’s new abilities, his brother’s actions, the surrounding cast, and respected the female characters more instead of just using them to show off some aspect of Donal. Questions for you: Did the ending events surprise you? Or were you expecting a planetary invasion after all the foreshadowing? Did you guess who Donal was kidnapping in Commander In Chief? What are your overall feelings on the book now that you’ve reached the end? Would you consider reading on in the series? 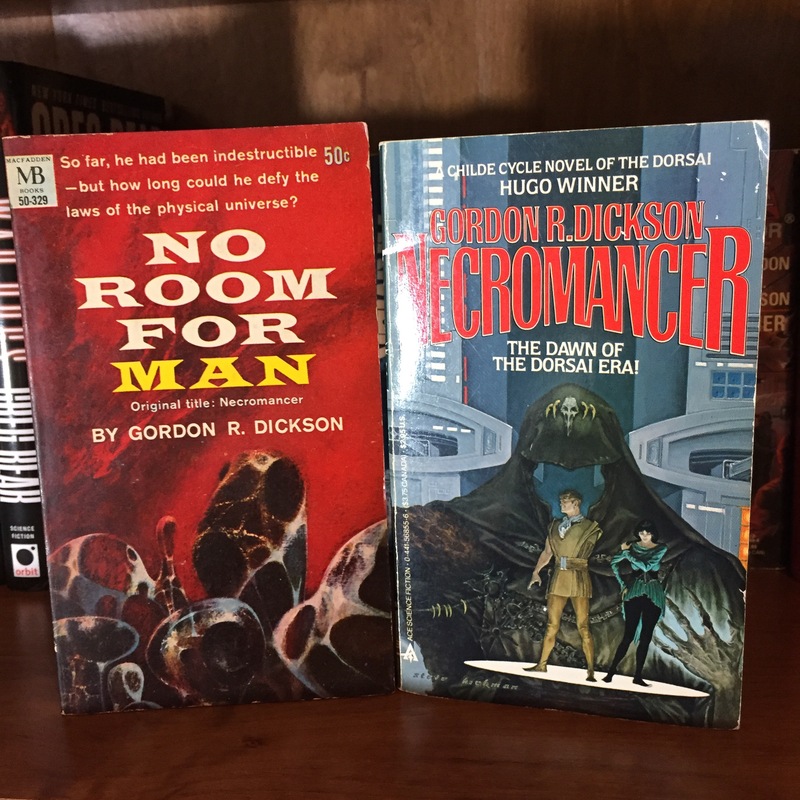 The next book in the series is Necromancer (formerly No Room For Man). It takes place long before DORSAI! and it sets the stage for the universe of The Childe Cycle. 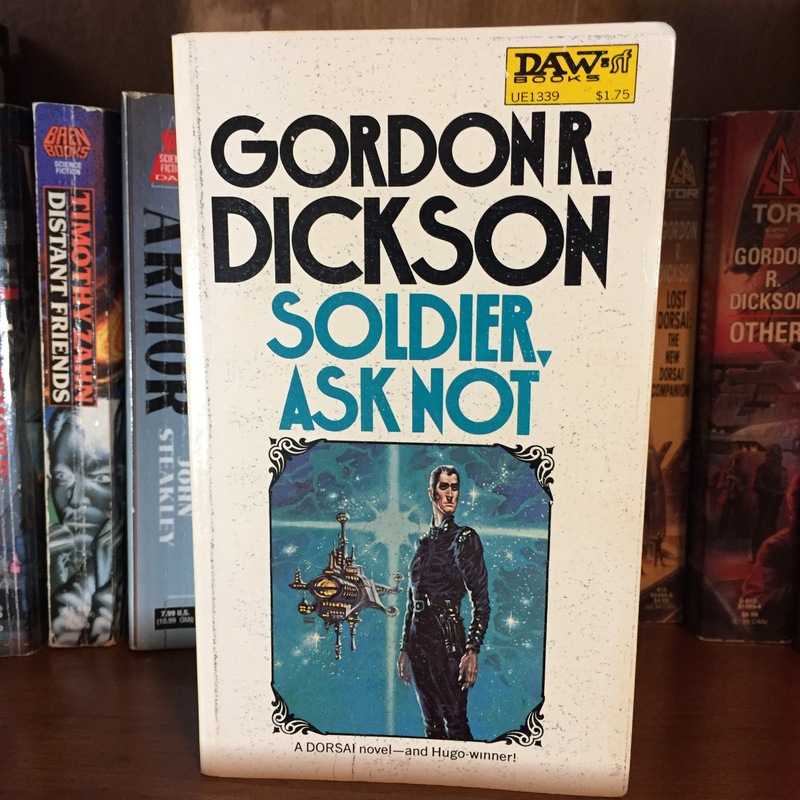 Soldier, Ask Not (one of my favorite titles ever) takes place parallel to DORSAI! and is quite intriguing. 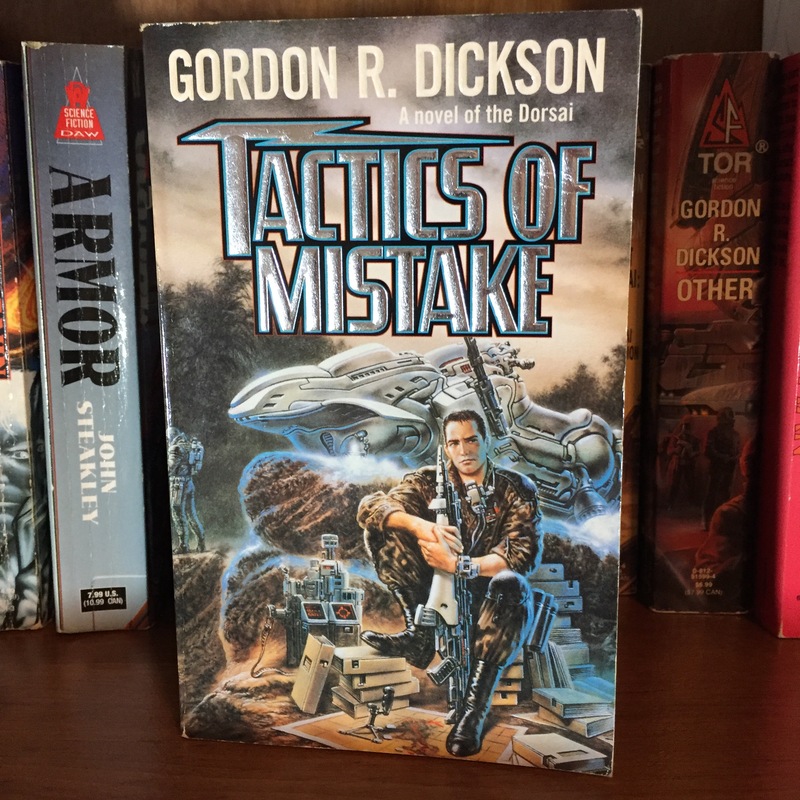 Tactic Of Mistakes is the fourth book and is a prequel to DORSAI! and follows Donal’s parents (I think). It is what I’m picking up to read next! Thank you so much for joining in on this group read! 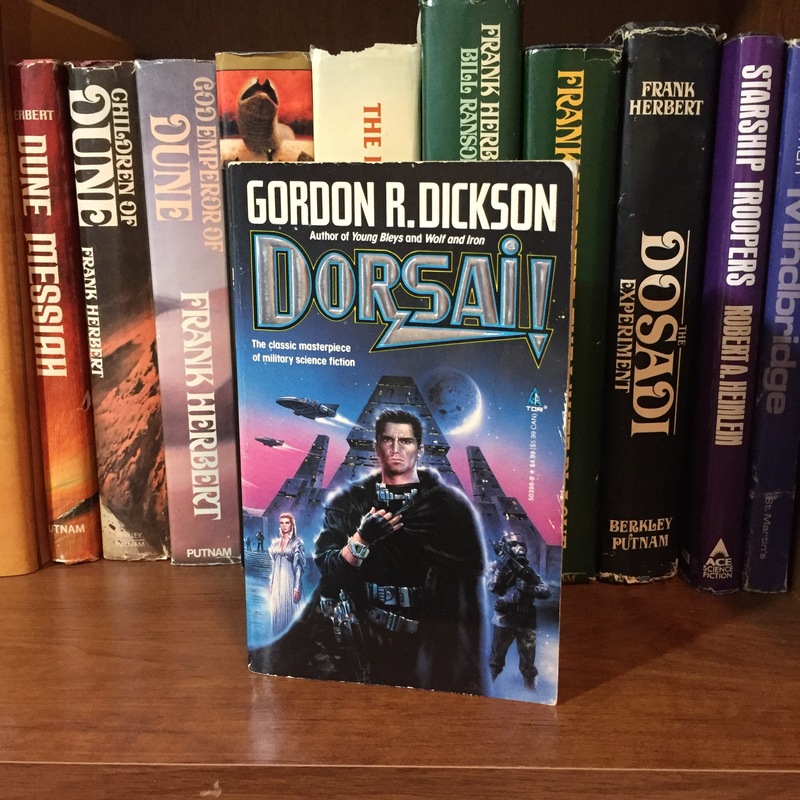 I hope you enjoyed your meeting with Donal and are willing to give Gordon R Dickson a chance to win some space on your bookshelf! 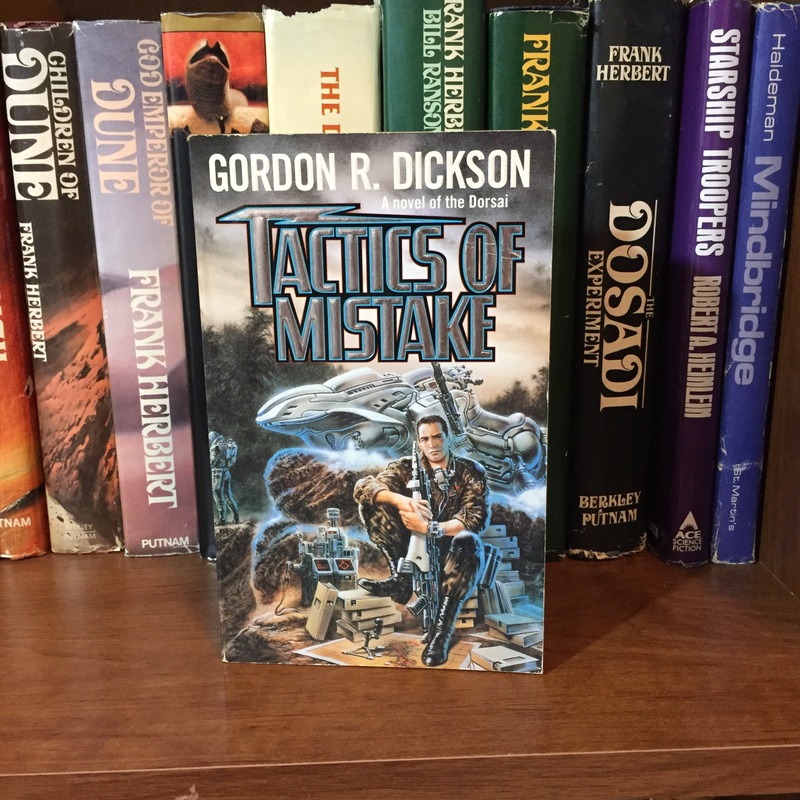 This entry was posted in Book Reviews, From My Bookshelf, VintageSciFiMonth and tagged Dorsai, GordonRDickson, GroupRead, scifi, VintageSciFi, VitageSciFiMonth on January 21, 2017 by redstarreviews. We’re reading DORSAI! by Gordon R Dickson for #VintageSciFiMonth and in this post we’ll cover Hero through Protector. Our hero, Donal Graeme, has gone and made himself into a full fledged once in a lifetime hero! But what side effects will the constant Shifting in space have upon his body, mind, and soul? He obviously has something special within himself, a gift from his diverse genetics combined with the unknown affects of the Shifting. Donal now faces the results of being a hero: greater responsibility. What seems confusing is why did he choose to work with such zealots? I think it is because he knew he could manipulate them. Are you surprised by they way he left the job? Did you expect him to take the mercenaries with him? Now to me the really interesting part of this section is his interaction with Sayona the Bond. You don’t have to tell me what it is, but do you have a personal philosophy? Do you think that we all do inside of ourselves? And what is this about Donal walking on air? One other question: Which of the characters that Donal has pulled into his orbit do you find most interesting? This Saturday we will post the final Group Read Post for DORSAI! Can’t wait to hear your final thoughts on this book! This entry was posted in Book Reviews, VintageSciFiMonth and tagged Dorsai, GordonRDickson, GroupRead, scifi, VintageSciFi, VintageSciFiMonth on January 18, 2017 by redstarreviews. 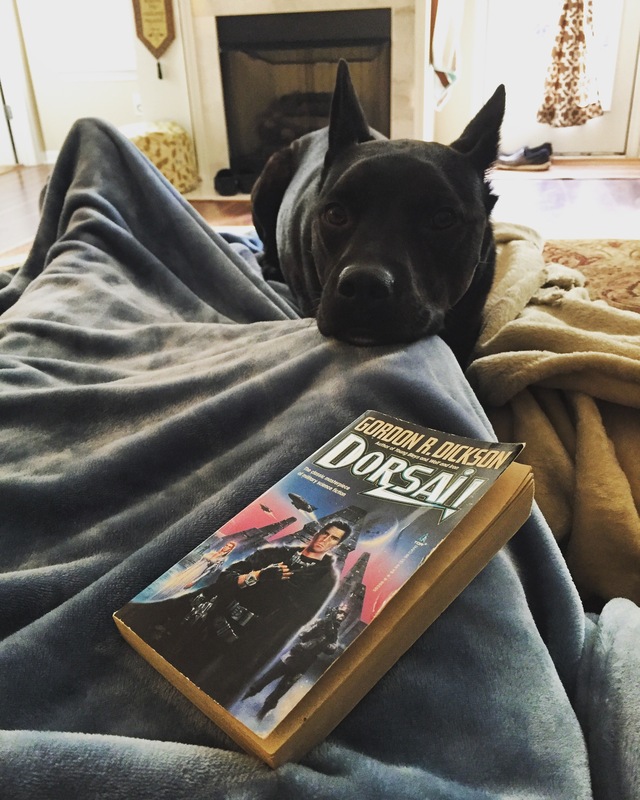 For those participating in the #VintageSciFiMonth Group Read of DORSAI! 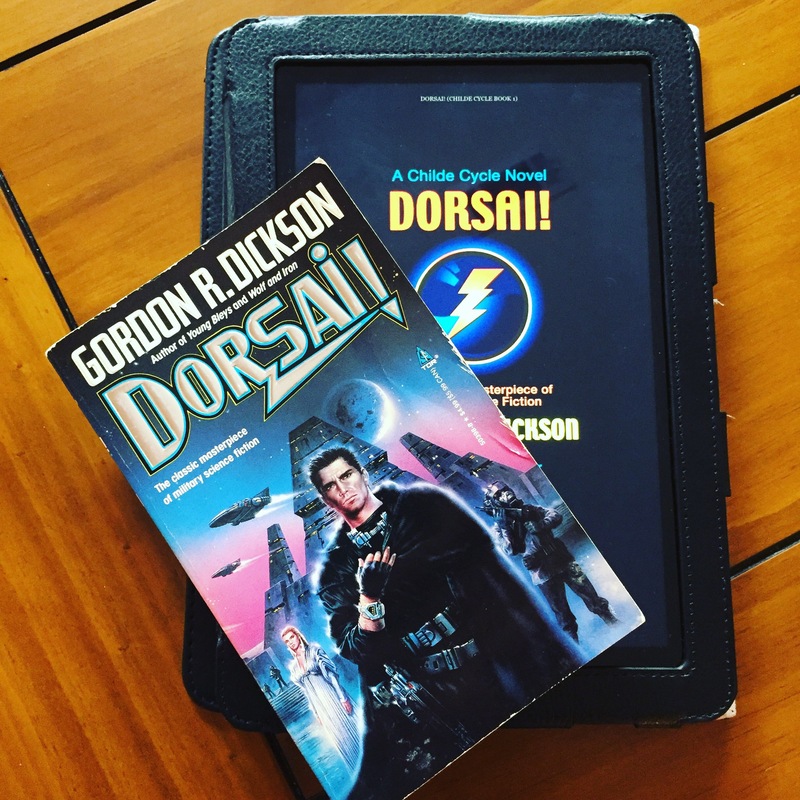 by Gordon R Dickson I hope you’ve been enjoying it! Hopefully you’ve had a chance to start reading and are ready to discuss! This discussion covers Cadet through Force Leader II. I’m really interested in your thoughts! One question I have when reading a Vintage SciFi Book is do you see this as a possible future for humanity? In this case how homogenous do you think colonized planets would be? It seems in this future they are taking such different paths that they’ve started to evolve differently. In the case of Donal what are your first impressions? Do you think he is odd? Would we realize that if the author didn’t tell us he was? I think we would. His interactions and the way he carries himself set him apart. Do you think he should have given that contract to William or destroyed it? Are you enjoying the pacing? To me it feels like quick glimpses and that keeps it moving fast. It seems to make it accessible for me. This entry was posted in Book Reviews, VintageSciFiMonth and tagged Dorsai, GordonRDickson, scifi, VintageSciFi, VintageSciFiMonth on January 4, 2017 by redstarreviews. On each Wednesday evening and Saturday Evening I’ll post a discussion post here on my website, link to it on both Twitter and Facebook, and I’ll post a reminder on Instagram. Feel free to join in on the discussion at any of these places that you like! This will be the central hub for everyone reading it, but I’ll gladly discuss it anywhere that works for you. DORSAI! Is an excellent entry point into the world of Vintage SciFi! It’s a military SciFi that’s written in an accessible fashion and also shows the fascination SciFi writers had with evolution and The New (or next) Man. While it adds in philosophy it also keeps the story moving along. This will be my third reading of it so I obviously think it’s a worthwhile read! You can purchase it for kindle HERE. Welcome to #VintageSciFiMonth and welcome to #DORSAI! This entry was posted in Book Reviews, VintageSciFiMonth and tagged Dorsai, GordonRDickson, GroupRead, scifi, VibtageSciFiMonth, VintageSciFi on January 1, 2017 by redstarreviews. Vintage SciFi Month Reading Plans! If 2016 doesn’t kill me then I’m going to get to celebrate a new year an another #VintageSciFiMonth in January! I’m so excited. Vintage SciFi Month has become an important part of my reading schedule. What is it? Basically: In January we read SciFi or Fantasy books published prior to our birth year! Check out the founder LittleRedReviewer’s post on VintageSciFiMonth for more details! DORSAI! 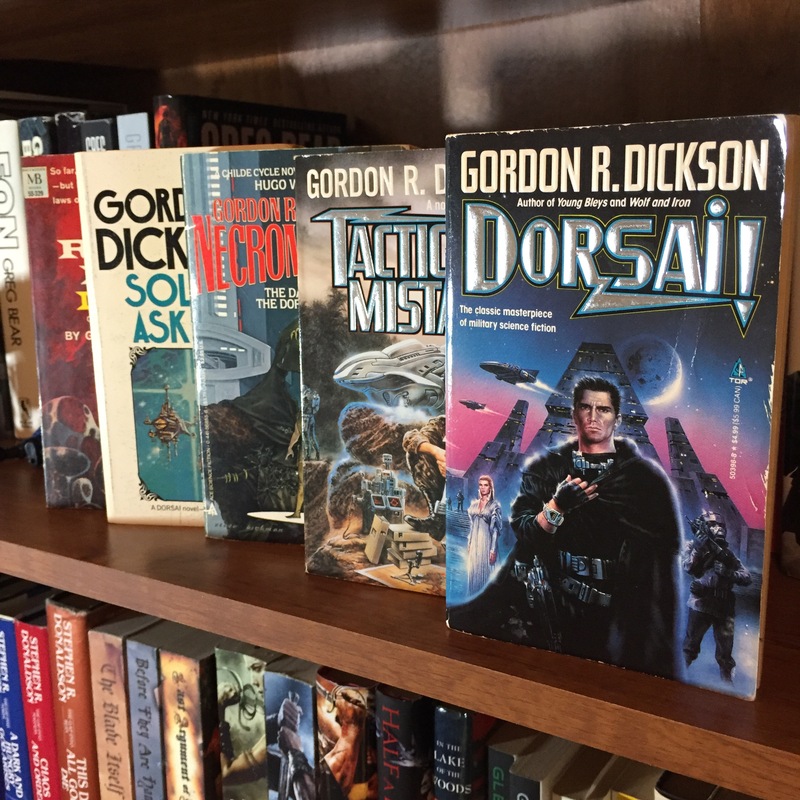 By Gordon R Dickson is the first book of his incredible Childe Cycle and I’ve been working through this series each January! This will be a reread for me BECAUSE I’m reading it with some friends who are starting their own Vintage SciFi Month journeys! If you aren’t sure what to read for this month please consider reading this book with us! You can purchase it here. If you want to see my review on DORSAI! you can find it here. I really enjoy this book which is why the next book on my list is…. Tactics Of Mistake also by GRD and also in the Childe Cycle! It is the fourth book in the series yet second chronologically. I’m excited to read this for the first time and discover more about this great universe. 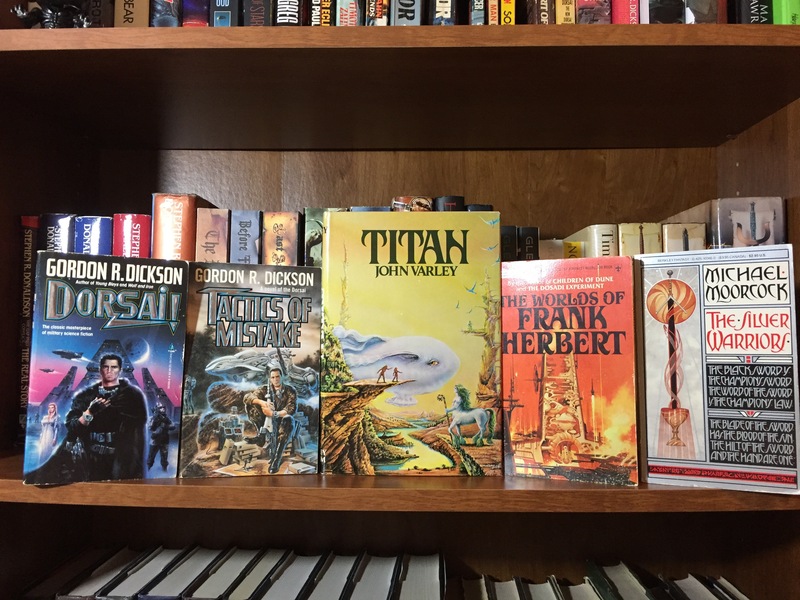 What would a Vintage SciFi Month be here at RedStarReviews if there wasn’t a little Frank Herbert? 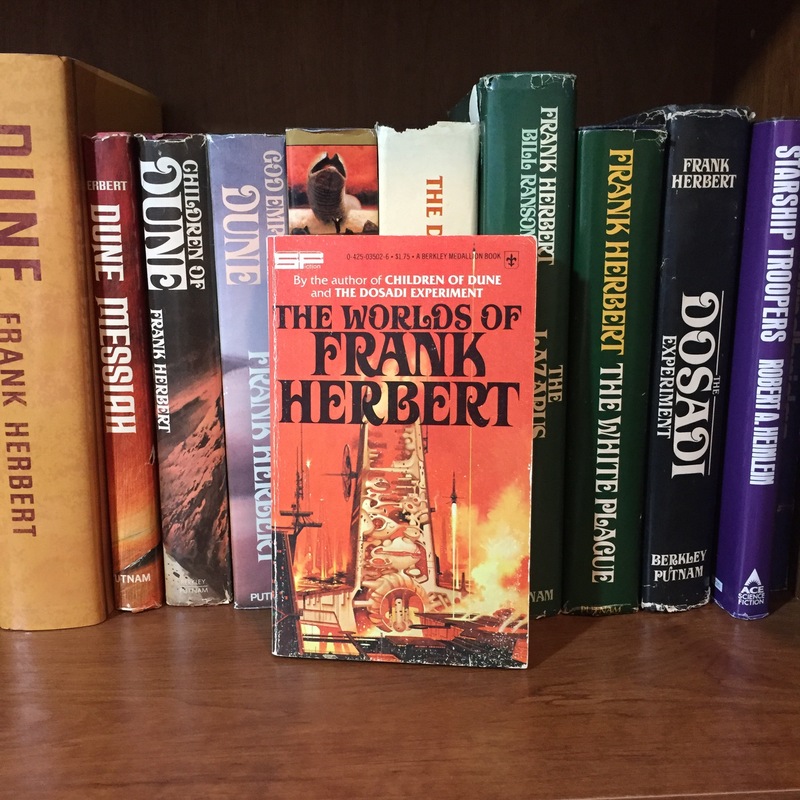 The Worlds Of Frank Herbert is a collection of his Short Stories that I’ve been slowly working on and will continue with during this month! 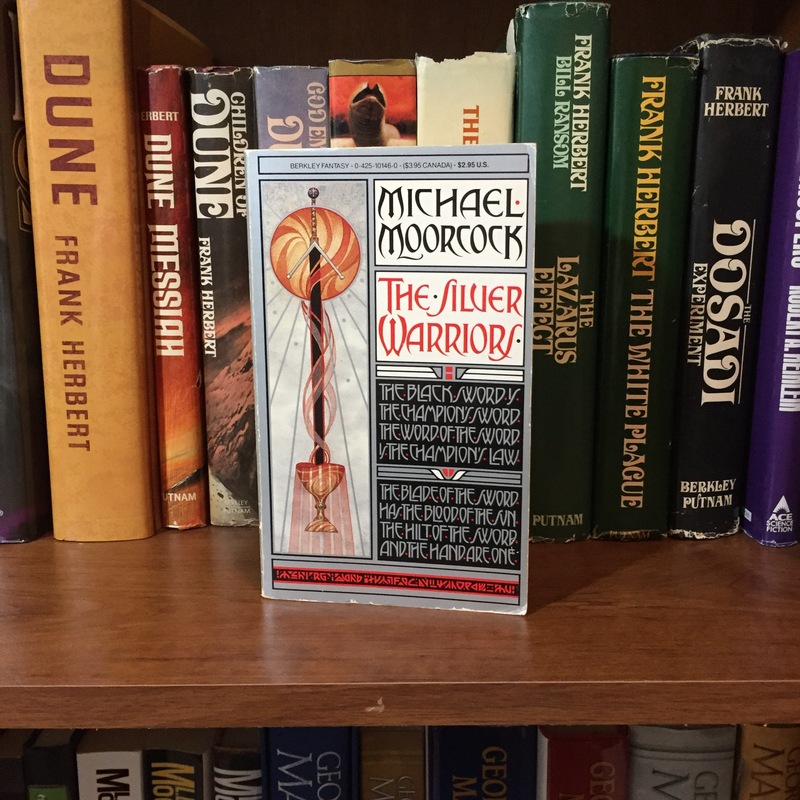 Michael Moorcock’s book The Silver Warriors is Fantasy, but Fantasy is totally ok by the rules of Vintage SciFi Month! I loved reading the Elric Saga and I can’t wait to see what this book has in store for me! 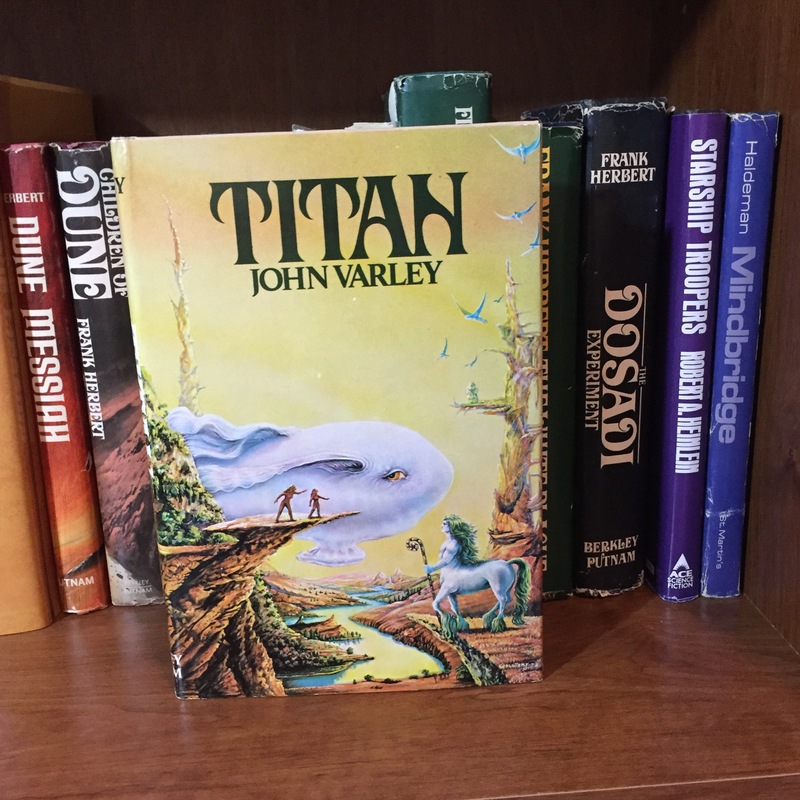 Titan by John Varley was published in 1979 which is AFTER my birth year but it’s ok some rules can be bent AND the founder of the Month oks and books 1979 and prior so if your birth year is making it tough to find a SciFi book that interests you then open it up to 1979 and before! This whole month is supposed to be fun so feel free to have some fun! Speaking of fun: I’ll be announcing a little Vintage SciFi Month giveaway here on my site on New Year’s Day! Stay tuned for details! Hope y’all have some excellent books picked out for the sixth annual Vintage SciFi Month! This entry was posted in Book Previews, Book Reviews, FirstAuthorContact, From My Bookshelf, VintageSciFiMonth and tagged ChildeCycle, Dorsai, Elric, FrankHerbert, GordonRDickson, JohnVarley, MichaelMoorcock, ScienceFiction, scifi, VintageSciFi, VintageSciFiMonth on December 29, 2016 by redstarreviews.